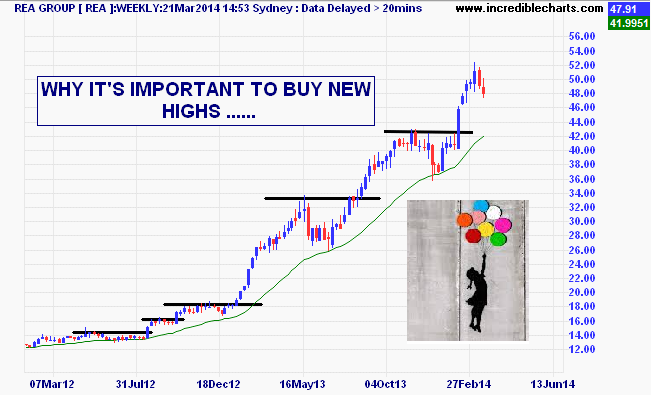 Words aren’t really necessary when looking at the charts below. 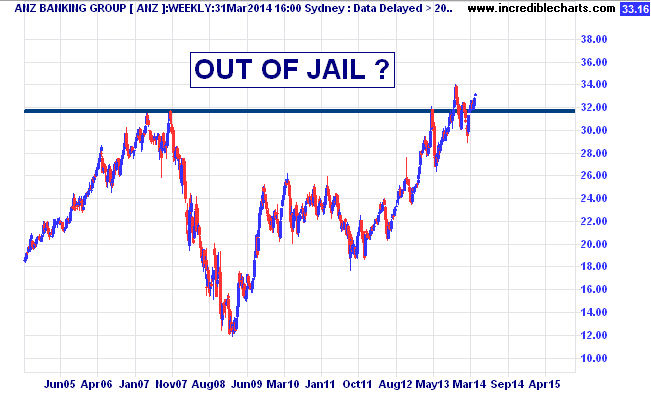 This ‘awesome foursome’ represents Australia’s finest – all are top 10 stocks, constituting at least 1/5 of the ASX/200. The market needs these guys to break out to the upside, however all are at formidable long term resistance levels.Their participation is essential. When/if they do, it’ll be the charge of the light brigade………. 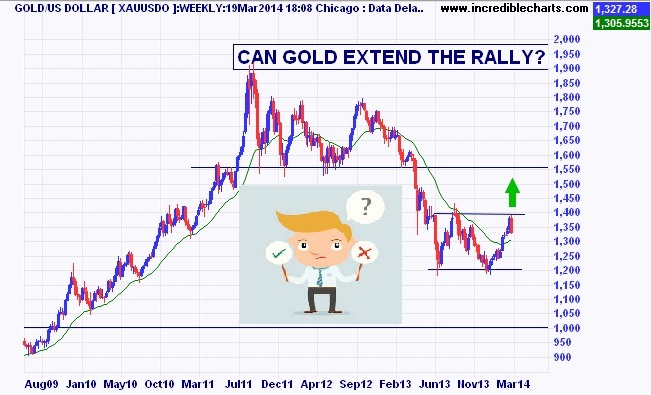 -Parity has been the big psychological ‘line in the sand’ for several years now. -The breakdown below 0.95/97 in March 2013 was a major development. 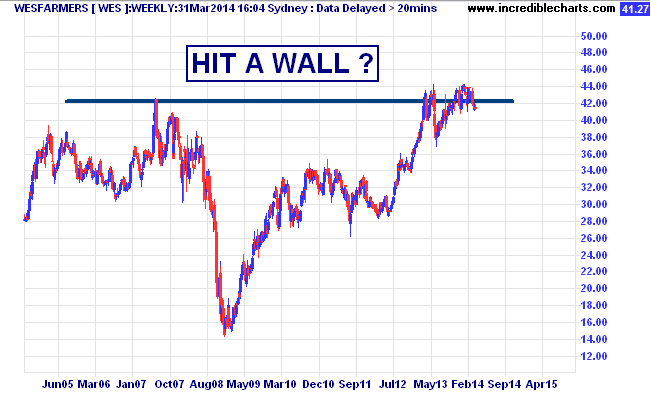 We saw broken support become resistance on the pullback late last year, and it’s been downhill since then. 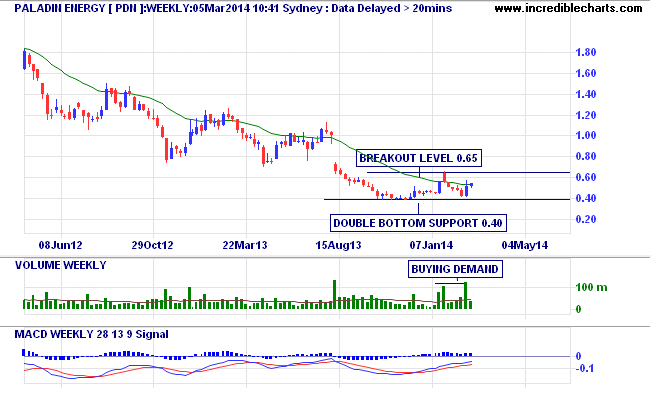 -Any decline below .87 on a weekly closing basis would bring .80 into play. 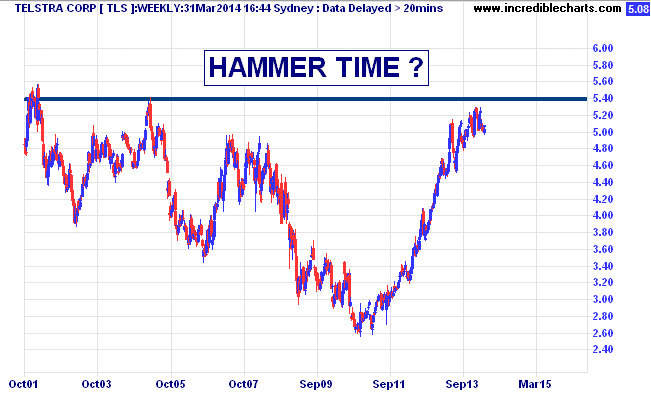 -I expect the long-term trend to eventually reassert itself, for a decline to support at 0.80. I have to laugh. The media has been all over the “Chinese slowdown” story like it’s a new thing. This is not a new story. It’s been going on for years – the Chinese stock market has been crashing since 2008. 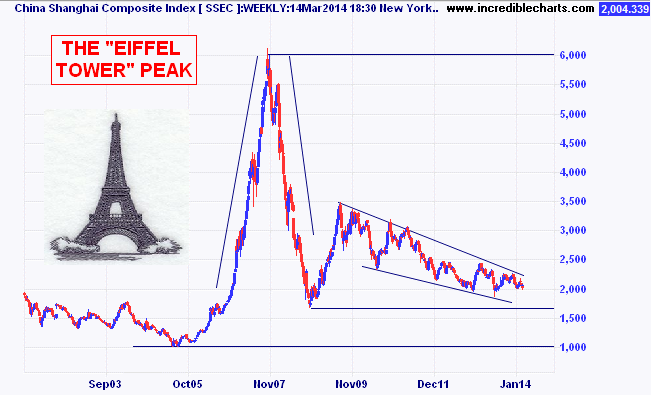 Calling a bottom on my “Eiffel Tower” (remember the tech crash in 2001?) would be a mugs game, but we are certainly getting closer to one……..
Nuclear power became ‘Enemy Number One’ in March 2011, when the Japanese tsunami caused the Fukushima nuclear power plant to melt down, and widespread environmental damage. Uranium stocks – the fuel for Nuclear energy – were hit hard while governments considered their options: Germany announced they would close all nuclear plants by 2022; while China, which is the world’s biggest growth market for nuclear energy, made statements about a more balanced energy program in the future. It was the perfect storm for Australia’s biggest uranium miner, Paladin Energy- the stock price went into free-fall, dropping from a high of $5.50 in early 2011, to around $0.50 cents today. The company has had three years of consecutive losses, and is currently selling its uranium for around $38 per pound, which analysts say isn’t enough to be profitable, or to repay its $300m worth of debt that matures in 16 months. free up some much-needed cash. It will also close its high-cost Kayelekera mine in Malawi. Two weeks ago, and rather fortuitously, the Japanese government declared that nuclear power would be an “important base load energy source” for the nation in the future – with almost 50 nuclear power stations idled since Fukushima, any kind of restart in Japan would help lift demand and therefore uranium prices. Paladin’s share price rose almost 20% on the day of the news, which you can see in late February on the chart. It’s important to note that the long-term demand story from China isn’t going away either. China’s energy needs are voracious. Today, the country only operates 18 nuclear reactors, providing less than 2% of its total energy output. But it’s building nearly 30 more to feed its growing energy needs. Paladin Energy’s immediate future remains uncertain. The company is doing what it can, but is fast running out of cash. It’s future profitability and survival depends on the price of uranium, and that critical variable and timetable is out of its control. This is a stock to watch. I’m neutral to bearish, and need to see uranium prices tick higher before buying it. There’s no hiding from the fact that Paladin Energy’s stock price has been slaughtered – first by the global financial crisis in 2007/2008, then by Fukushima in 2011. That’s the big-picture view, and I must say it’s rare to find a chart that looks this bad. The relentless march on lower lows and lower highs was confirmed by volume, which rose when prices dropped, and fell when prices occasionally went higher – not a good sign if you’re banking on a turn! That said, I’m beginning to see green shoots in Paladin – evidence of price demand supported by an improving fundamental story. (Price often leads the fundamentals, but it also has a role in confirming a change in them. In early August there was a fierce gap-down, accompanied by a large spike in volume – evidence of a possible ‘wash-out’. This is an important question, because major market turns often occur after ‘wash-outs’, when everyone who’s thought about selling has thrown in the towel. Major turns also like to happen quietly, not when buyers suddenly turn up, or when the newsmen shout about them from the front pages, but when the sellers dry up – and we can see evidence of this in the declining volume bars on the ‘quieter sell-off’ between August and the New Year. 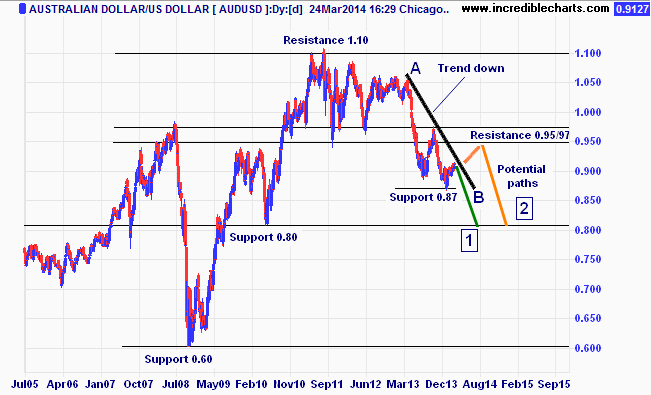 Since then, a potential double-bottom has formed around 0.40 cents, which has become an important support level. It looks solid enough so far – and the subsequent price rise was met with increasing volume, indicating fresh buying interest, probably institutional ‘smart’ money, well before the public announcement from Japan. Price also failed to make a new low, below $0.40. These are all positives, and make me think the pendulum might be swinging back to a demand-dominated supply balance. Finally. There are still some hurdles to overcome, in the form of resistance above. The 28-period exponential moving average – a reliable “line in the sand’ indicator in my experience – lies directly overhead, at $0.55, and is still trending slightly down; and above that there’s the first rally peak, at $0.65. Breaking the $0.65 level on a weekly closing basis would be a major victory for the bulls because it would provide a higher high, and confirm a new bullish pattern of higher lows and higher highs – the textbook definition of an uptrend. If Paladin can work its way through that then it’s clear skies ahead, all the way up to our target, $1.20. Paladin is showing signs of a major turn. It’s still early days, but positive sentiment could quickly shift – swift moves down are often met by swift moves in the opposite direction. 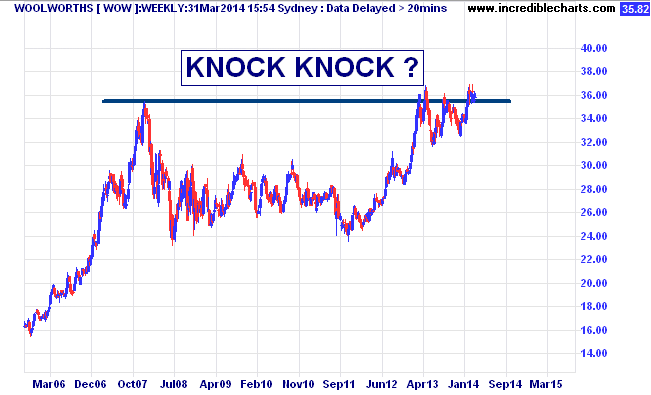 I’m a cautious buyer, with a stop-loss at $0.40 on a weekly closing basis, targeting $1.20. Fathers and sons inevitably have ups and downs throughout life, but especially when sons become young men. My father certainly gave me a hefty workout in those days; my radical and idealistic ideas clashed heavily with his ever present voice of reason. “When you’re 21, you can do what you like, but right now while you’re under my roof……….” That’s how it went, and boy was I fuming! Now that I have my own kids (my son is eagerly telling me he’s about to turn the big seven), I am becoming acutely aware of this perspective, and the challenges that lie ahead. I can see the wheel turning right back at me. My father and I spend long hours together. We go to the test cricket, the footy, lunch, and discuss all kinds of things – various aspects of family life, sisters, brothers, daughters, grandchildren, the financial markets, and all now with an open and contented honesty that we both thrive on. I’ve finally grown up – sort of, I still feel 25 in his presence, but my admiration and respect for him is what it should have been back in those difficult teens. Our relationship is in a good place. Occasionally he calls me with his thoughts on the financial markets. I should preface this by saying he usually takes a very conservative approach to his investments, but he has taken some very left-field positions in is time. At least that’s how they felt at the time. He bought gold futures in 1986, before it nearly doubled in price. 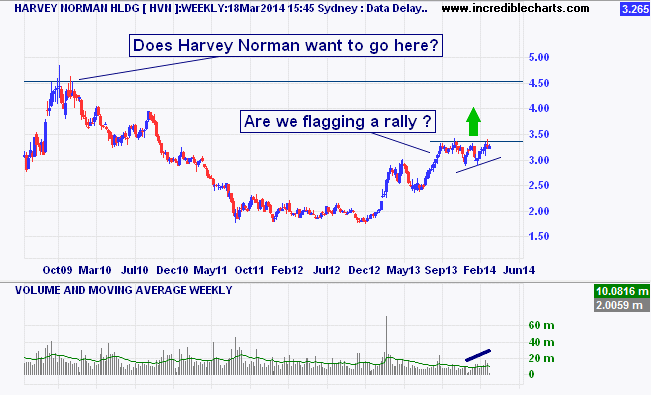 He sold News Corp shares while the bull raged in 2000, before it fell from $26.00 to $4.00. 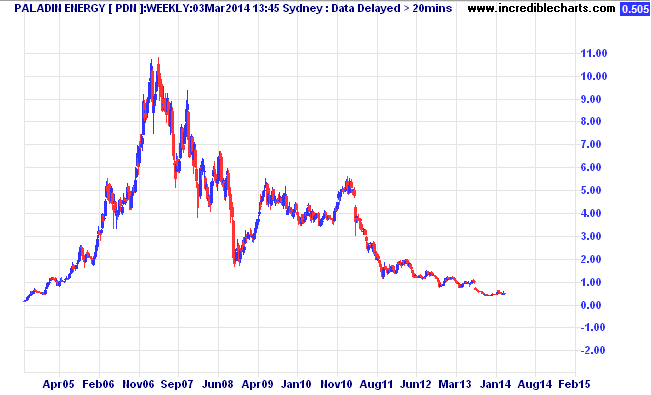 And he sold Rio Tinto during the BHP bid in 2008, when the price was $120 – soon after that, it was at $25.00. My dad was a contrarian, who knew? A damn good one too. Both wise and profitable. It got me thinking. What does he do well? What’s his edge? He doesn’t read or study the market very much. And he’s not a risk taker either. But he does have an uncanny ability to take a detached market view. He does what he thinks is right, and always avoids the nutty chatter of the crowd. I had lunch with him the other day, and asked him for his thoughts on interest rates. As a retiree he’s sick of the super-low rates on bank deposits, as I’m sure many of you are too. I asked because there are very few top quality stocks that are both undervalued and high yielding in this current market. But this doesn’t bother dad. He still likes the banks, and is still targeting them for more growth. Certainly, Australia’s ‘big four’ banks are well protected, and continue to generate fantastic capital appreciation and dividend growth – I should add that dad’s one of the lucky few to own parcels of CBA at $5.00. He has a point. In the absence of other conservative high-yielding alternatives, do we really need to look further afield? Dad’s objectives are now geared more towards his children and grandchildren, who will be the beneficiaries of this investment wisdom. His straightforward ‘common sense’ approach has looked after him well in life, and it’s a philosophy we could all learn and prosper from when dealing with the stock market, whether as traders or investors. 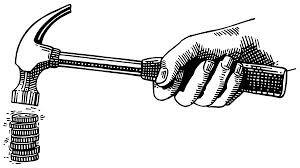 Sound reasoning and clear objectives are what ultimately build a successful investment philosophy.